Every book has its own story. And many a story has yet to be told. I'm not talking about the story that is printed on the pages of a book. I'm talking about the story of the book itself. Who bought it? Where did it go afterwards? And how did it end up in my library? In June 2008, my friend Fred Farrar experienced a temporary glitch in his financial situation, and asked me to sell some of his books for him. Fred was one of "the bookies" who met for breakfast in New Port Richey, Florida on Friday mornings. My wife called us "bookies" because we all had something to do with books. Fred was a longtime collector of books and historical newspapers. 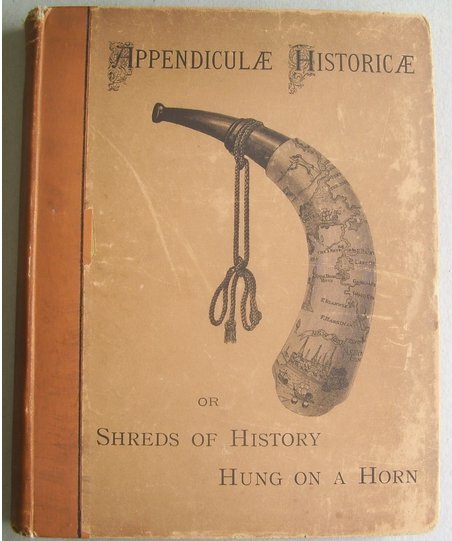 One of the books Fred wanted me to sell was Appendiculæ Historicæ: or, Shreds of History Hung on a Horn. 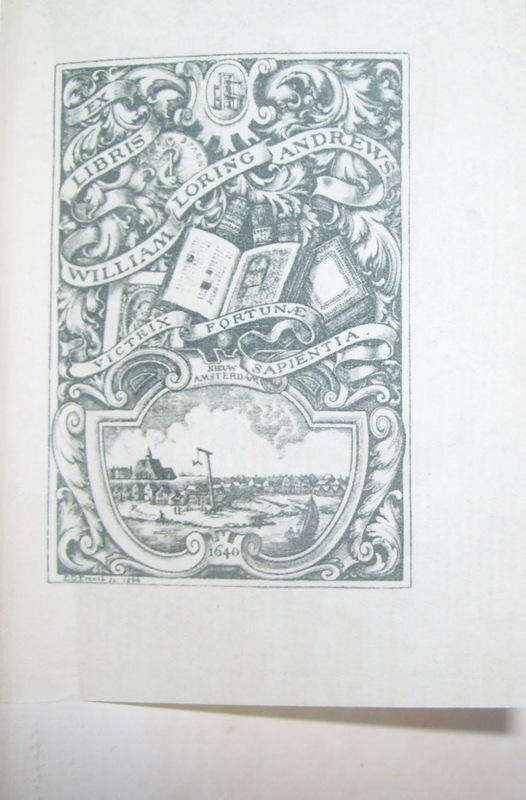 Lightly pasted on the front free endpaper of the book was the bookplate of the renowned New York City book collector, William Loring Andrews (1837-1920), a founding member of both the Grolier Club and the Society of Iconophiles. It didn't surprise me that Fred had a copy of this book. His library was rich in American history, both in books and newspapers. 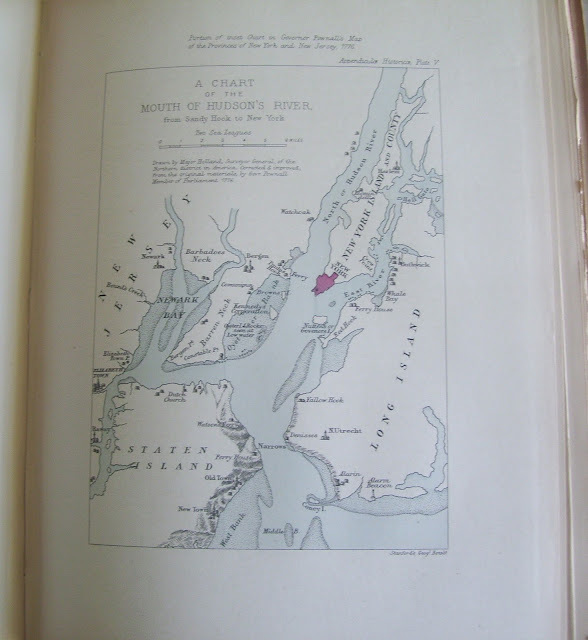 Moreover, he was a member of the American Antiquarian Society. Fred had already started donating some of his historical newspapers to his Alma Mater, Washington & Lee University. As much as I wanted the book, I knew I couldn't afford it And I hadn't even added WLA's provenance value to the cost of the book. Moreover, I owed Fred a favor or two. Two years earlier, while I was anxiously awaiting the approval of my disability retirement application from the Post Office (big-time heart problems), Fred had helped to keep me out of the poorhouse by buying many of the pre-1800 books in my library, including a 1678 edition of Jeremy Taylor's Antiquitates Christianæ that was in mint condition. Jan Clark, from Michigan, was another friend who had helped me out financially in 2006. She was a Books About Books Collector herself. But her husband Bill was an Aviation enthusiast. And Jan bought My Sentimental Airman Collection en bloc for her husband. Two years later, in June 2008, I queried her about buying Fred's book that was formerly owned by William Loring Andrews. Jan wanted a book from WLA's library, but requested further proof that the book actually belonged to William Loring Andrews. She also wanted to know how Fred had acquired the book. Jan had cause for concern. 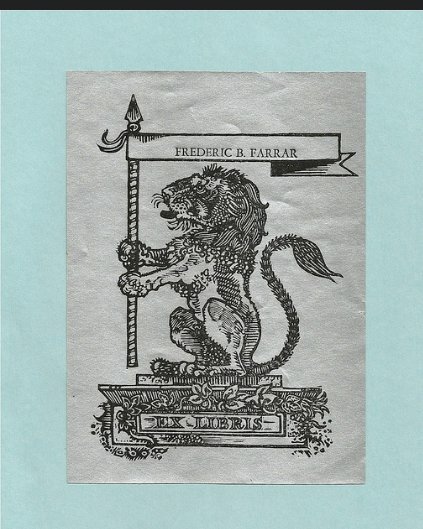 The bookplate itself was, in fact, a small lithographic copy of the bookplate E. D. French engraved for WLA in 1894. Moreover, I could find no additional evidence to prove that William Loring Andrews was the former owner of this book. And Fred could not remember where or when he had acquired his copy of Appendiculæ Historicæ. 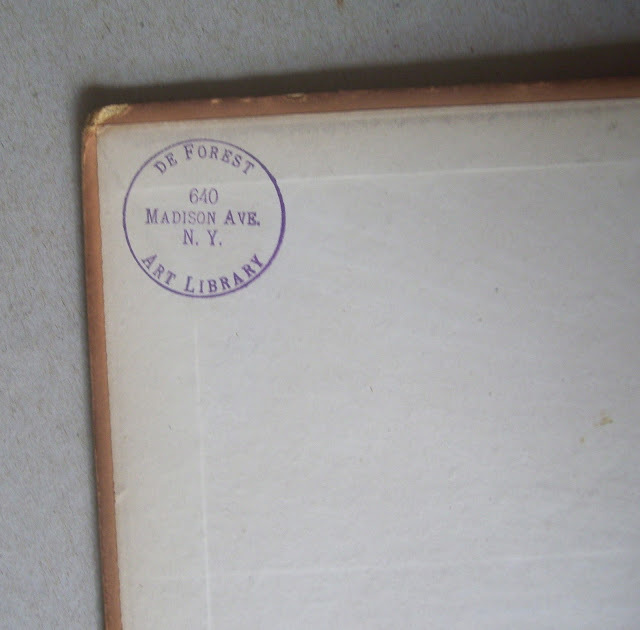 Stamped on the front pastedown of the book, however, was an ownership stamp belonging to the prominent New York art dealer, Augustus F. De Forest (1852-1946): "De Forest Art Library 640 Madison Ave. N.Y."
I would have preferred that Fred's book be stamped "de Forest Library of Americana," but "de Forest Art Library" at least established provenance. And De Forest was as far as I could go on the ownership trail. 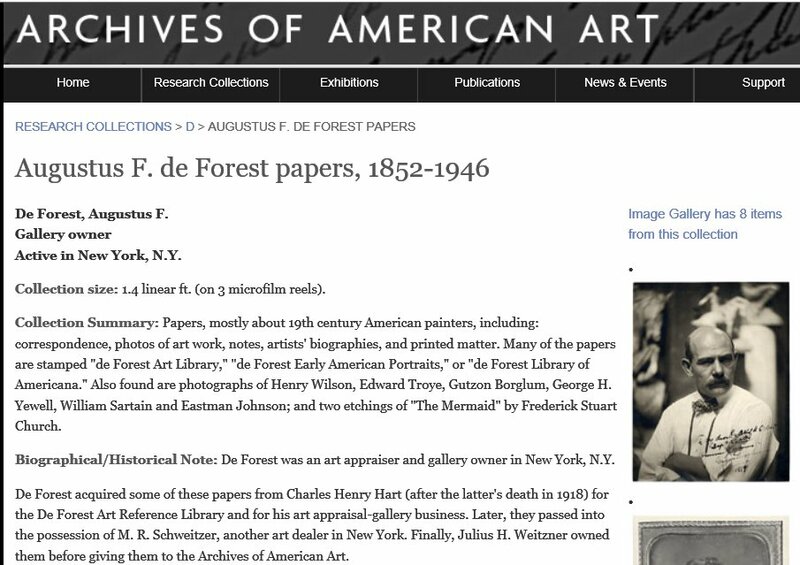 Interestingly, one of the eight sample images of the De Forest Papers in the Smithsonian Archives of American Art was a book containing fragments of two plays from John Bell's British Theatre, thus verifying that books were part of the Augustus F. De Forest Papers. A few weeks later, Fred and Jan agreed on a price for the book. And that made us all happy. Fast forward to July 29, 2014. 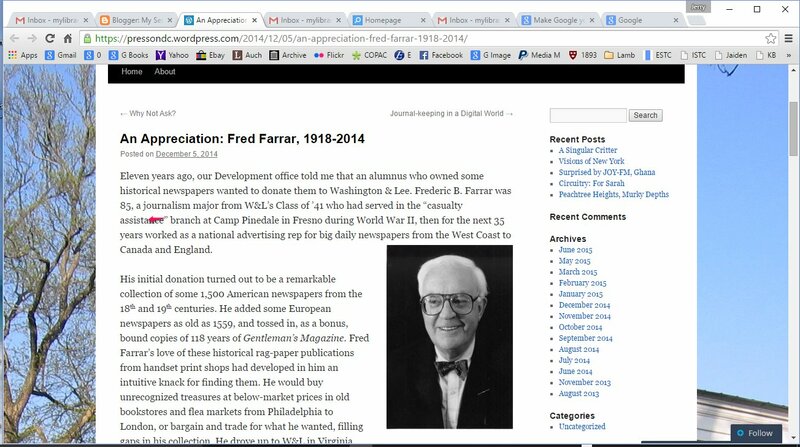 Fred Farrar passed away at the age of ninety-six. Several weeks later, Jan Clark decided to downsize her library. And I bought Fred's copy of Appendiculæ Historicæ from her for my own library! Either my online researching skills have improved considerably since the last time I saw this book, or the information I found online about the sale of WLA's books wasn't on the web in 2008. Nevertheless, I can now offer more small shreds of history regarding the ownership of this book, but yet, still more conjectures. 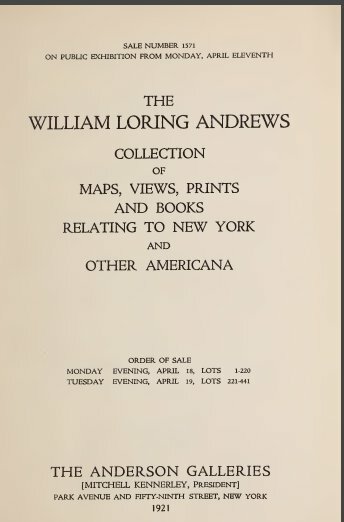 William Loring Andrews was the second President of the prestigious Grolier Club in New York. And he was the first to suggest the club be named after Jean Grolier. WLA either sold or gave away most of his books before he died. In 1894, he donated his collection of early printed books to Yale University. And in 1919, he sold his library to the New York bookseller, Francis F. Drake. 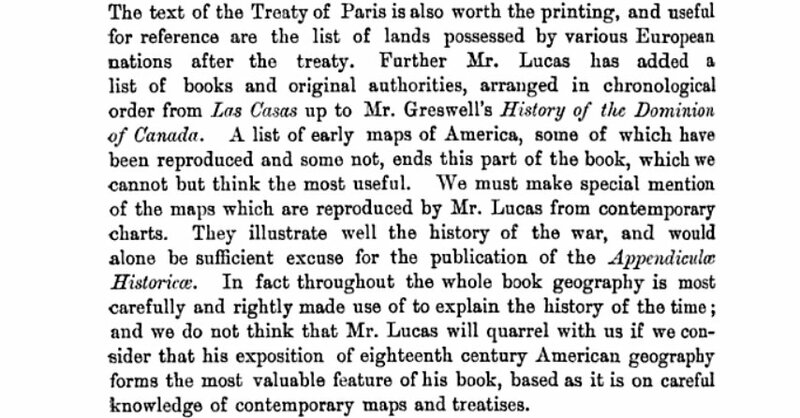 His book, Appendiculæ Historicæ, was part of his Americana Collection. And Drake didn't put this collection into his stock for immediate sale; instead, he put the collection in storage, intending to publish a separate catalogue of the books in June 1920. But Drake never found the time to catalogue the collection. 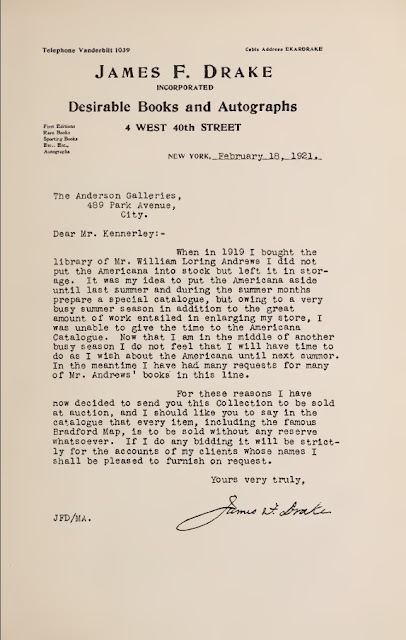 And in February 1921, he contacted Mitchel Kennerley, President of the Anderson Galleries, and arranged to have the WLA Collection of Americana put up for auction. On Tuesday evening, April 19th, 1921, WLA's copy of Appendiculæ Historicæ sold for $22. 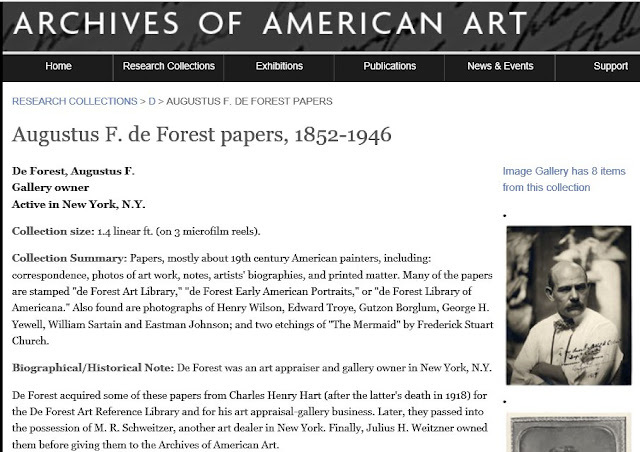 The winning bidder most likely was Augustus F. De Forest. And Anderson Galleries provided a small lithographic copy of WLA's bookplate to the winning bidders, which Augustus F. De Forest lightly pasted in the book. 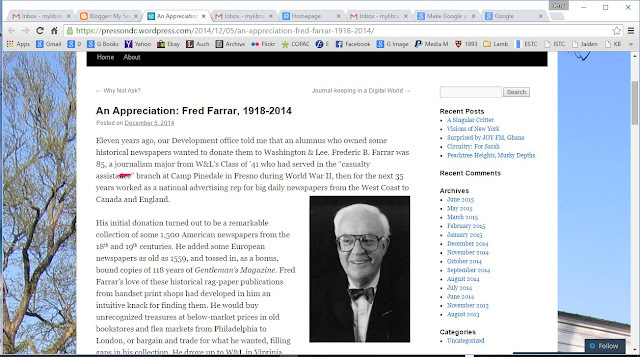 After serving his country during WWII, Fred Farrar was a newspaper advertising executive for almost 35 years—and based in New York City the latter part of that time. Fred was a patron of the arts, and he may have acquired the old oil paintings I observed in his house from either Max R. Schweitzer or Julius H. Weitzner in the 1950s or 60s. 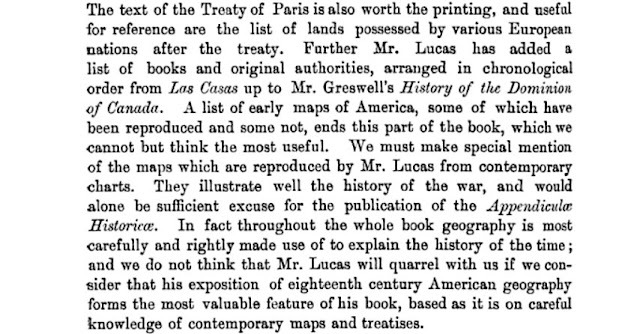 That same conjecture goes for acquiring his copy of the book, Appendiculæ Historicæ. My late friend Gabriel Austin was once an art dealer in New York City. And he sold books as well as art. Fred Farrar added no personal marks of provenance to his copy of this book. But I have his bookplate. 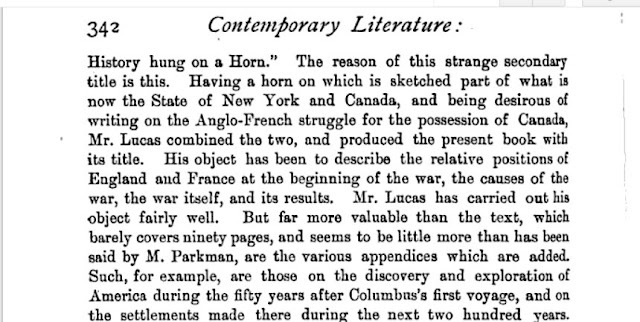 And I shall paste it in the book to display one more shred of history of the ownership of this copy of Appendiculæ Historicæ; or, Shreds of History Hung on a Horn.